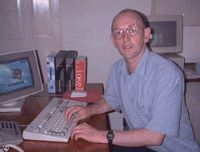 I am a z/OS system engineer and the creator of the Hercules ESA/390 emulator, which in 1999 caused a minor revolution in the mainframe computing world by enabling private individuals for the first time to run mainframe computer software on their own PC's. And what's more, I gave it away for free. I must be nuts! It would be difficult to argue that antipersonnel landmines are not evil. Yet incredibly, 36 countries including the USA still refuse to sign the international treaty which bans their use. The US Campaign to Ban Landmines is working to change this. My Trucs and Astuces pages contain some miscellaneous hints and tips which I have found useful in my work as a z/OS systems programmer. And who knows, you might find something useful here too. Suresnes Some buildings and places I like. Roger's Motoring History Cars I have known and loved. Interrail73 Some pictures of a few of the people I met during my Interrail tour of Western Europe in summer 1973. MétroPole Le site non officiel de la RATP An absolute goldmine of news and information for Paris Metro enthusiasts. Le Défi Métro Comment parcourir toutes les stations de métro de Paris en une seule journée. Do you need to deliver 3270 legacy applications to your users via a web browser? Then get VIRTEL Web Access from SysperTec Communication. VIRTEL delivers any VTAM 3270 application (CICS, IMS, TSO, RYO) to any user who has a web browser. VIRTEL delivers HTML direct from z/OS or VSE to the browser. SysperTec is an independent software development company owned by its managers. SysperTec has over 20 years experience of supplying mission critical software to more than 200 of France's leading financial, manufacturing, and government institutions. From 2001 to 2013 I worked for SysperTec supporting their flagship product VIRTEL. SNACONS is a terrific product (I use it all day every day in my work), but marketing and supporting it actually cost me more than the meagre revenue it brought in. With the lowest-priced OS/390 development system offered by IBM costing more than 20 times the gross annual revenue of SNACONS, it just wasn't a cost-effective proposition. As Dave Cartwright said, Great product, rotten marketing. Any hope of SNACONS becoming a viable product was scuppered by the announcement of z/OS V1R1, when the folks at Poughkeepsie decided that similar functionality would henceforth be shipped as an integral component of the operating system. Errr, thanks guys! SNIPIX was a terrific product too, but it failed to sell a single copy, living proof that nobody is interested in SNA any more. At least, nobody with a budget. And the announcement that Anynet will no longer be available after z/OS V1R7 was the final nail in the coffin for SNIPIX. Is it my imagination or are they trying to tell me something? Another great product which bit the dust before it even hit the market. A nice idea but badly timed. The demise of SNA happened faster than I predicted. One satisfied customer (MAN Truck and Bus UK Ltd). Not sure why this wasn't more successful. Wait while I chastise the marketing director (ouch! that hurts!). My first, and surprisingly, most successful product. Sold around 40 or 50 copies if I recall correctly. Faded into obscurity when I decided not to produce a Windows 95 version, having thrown my hat into the OS/2 camp at the time. Oh well, we all make mistakes. http://www.hercules-390.eu The Hercules project -- S/370 and ESA/390 on a Pentium!